The Jacksonville Jaguars are a team in the NFL with a lot of talent offensively and have the potential to be a playoff team in the AFC Conference, but never seem to get past a certain point or make it into the postseason. With one of the best running backs in the league in Pro Bowler Maurice Jones-Drew and tight end Mercedes Lewis coming off a breakout season, this year was looking promising for the Jaguars as they might have been able to contend for the AFC South division title. Unfortunately, despite everything they had going for them, the team made a drastic decision just days before the season opener against the division rival Tennessee Titans by cutting longtime starting quarterback David Garrard. It has been well known over the past few years that Garrard is a good quarterback in this league, but nowhere near a great quarterback like two other quarterbacks within the AFC South division in four-time NFL MVP Peyton Manning (Indianapolis Colts) and perennial Pro Bowler Matt Schaub (Houston Texans). 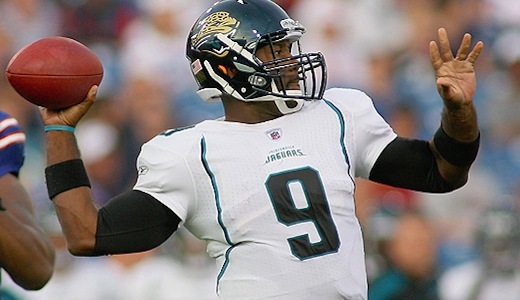 With that being said, the Jacksonville Jaguars never really pictured David Garrard as a long-term quarterback, but rather the guy to fill in under center until they did find the right guy to take this team to the next level. Ironically enough, Garrard is coming off one his best seasons for the Jaguars as he had five of his best eight games of his career last season and led Jacksonville to many come-from-behind victories. Obviously, this wasn’t enough to prove his doubters in the front office in Jacksonville wrong as they drafted rookie quarterback Blaine Gabbert in the 2011 NFL draft and now have cut him loose just before the beginning of the NFL regular season. This move to let the starting quarterback go surprised everyone around the league and the majority of the Jaguars players as no one thought that either Luke McCown or Blaine Gabbert had a shot at the starting job heading into Week 1 against the Tennessee Titans. Despite this coming as a complete surprise to NFL analysts and fans around the country, this may have been something brewing in Jacksonville for quite some time as Jaguars owner Wayne Weaver has put head coach Jack Del Rio on the hotseat by saying that it is playoffs or bust this season and the team stood to save $9 million dollars by cutting Garrard before the first week of the season. So in essence this move has turned out to be a purely financial and a way for Jack Del Rio to start off what could be his last season in Jacksonville with a new starting quarterback. With the Jaguars drafting Blaine Gabbert to be the future face of the franchise under center the obvious choice was that the rookie would be the starter for Week 1, but it appears that Del Rio would like to start the season with Luke McCown as his starter and slowly work in Blaine Gabbert.